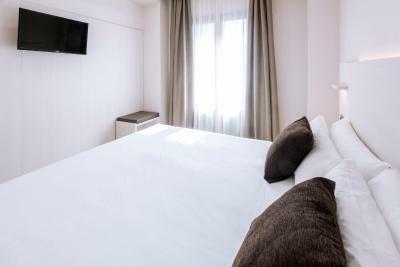 Lock in a great price for Hotel Serhs Carlit – rated 8 by recent guests! Staff is friendly and helpful. Breakfast is tasty and food selection is vast and very good. Location is awesome - just a few minutes walk to the old city and to Sagrada Familia. Closeness to main plazas and available options for public transportation. Staff were very helpful and all knew english. Location was good for us. The location is great in El Eixample, close enough to subway and bus as well as tourist locations, but far enough from loud areas. Tons of stores and cafes and restaurants in the neighbourhood. The reception staff is friendly and polite and check-in/out processes are easy and fast. The speak multiple languages. There's a luggage storage room for leaving bags before check-in or after check-out. Bed is very confortable, towells of very good quality and TV comes in international channels as well. 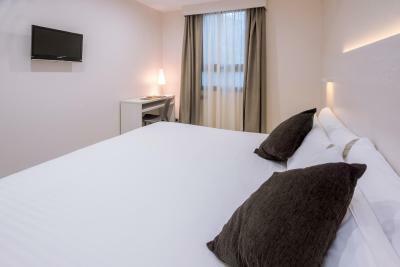 It is a pretty well built and appointed hotel with nice rooms and bed. Modern. Near to the cathedral and the river area without being so close as to be noisy. I think I stayed in this place before when it had a cocktail restaurant but now it seems it is going the low-priced route - not as much service or amenities, but still a good, clean, decent room for a reasonable price. I hope they don't let the physical plant depreciate, as sometimes happens when a hotel goes this route, but at this time, the room was clean and very serviceable. The shower wasn't huge but everything worked. The Localization was really good, especially if you arriving from Barcelona Nord station. It was ok going around in the evening. 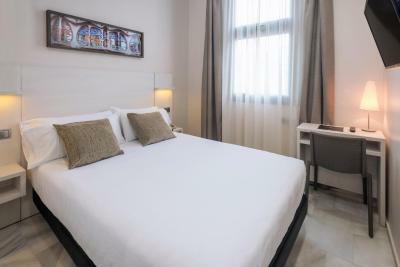 It is 10 min walking from La Sagrada Familia or Passeio da Graca, in the other direction. And less than 30 min walking from other keys parts of the city. Staff was really helpful and assisted me in all my requests. Room, bad and pillows were very comfortable. Great relaxing shower pressure. rooms are clean. staff is friendly. breakfast with fruits is good, but no any changes. The hotel met our expectations. We needed a place to wind down on our trip, and this place met our expectations. It was very comfortable, quiet, and clean. Hotel Serhs Carlit This rating is a reflection of how the property compares to the industry standard when it comes to price, facilities and services available. It's based on a self-evaluation by the property. Use this rating to help choose your stay! One of our best sellers in Barcelona! 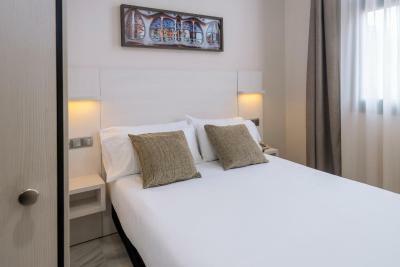 Hotel Serhs Carlit is located in Barcelona, 2,950 feet from the iconic Sagrada Família Basilica and Passeig de Gràcia Boulevard. It offers a 24-hour reception and air-conditioned rooms, all with free WiFi and a flat-screen satellite TV. 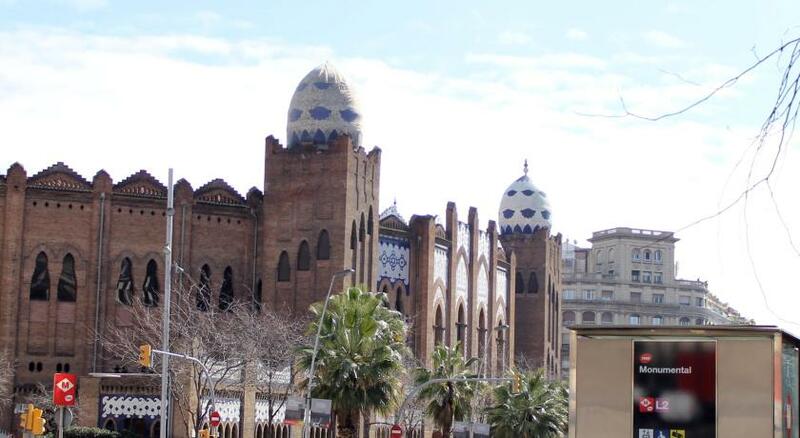 The Serhs Carlit is a 10-minute walk from Arc de Triomf, with Ciutadella Park and the trendy Born district just beyond. You can walk to the Agbar Tower in 15 minutes. 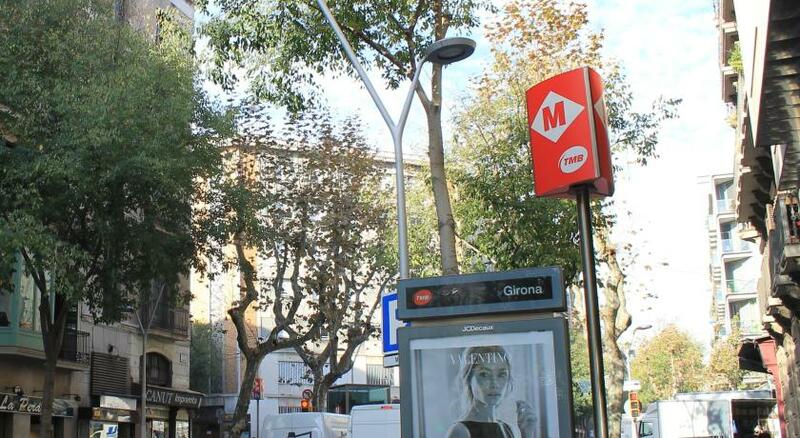 Tetuan Metro Station is just 650 feet away, just 1 stop away from Passeig de Gràcia. Estació del Nord Bus Station is 2,450 feet away. The hotel has a café-bar serving a daily buffet breakfast, as well as snacks and drinks throughout the day. 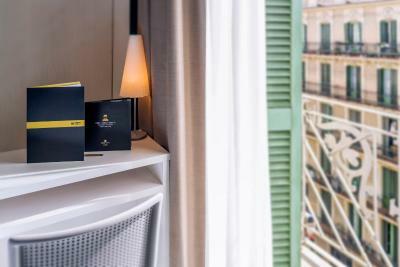 Staff at reception can provide information about what to see and do in Barcelona, as well as offering restaurant recommendations. When would you like to stay at Hotel Serhs Carlit? 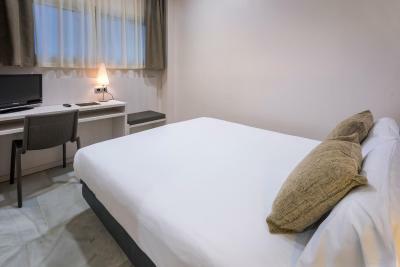 This air-conditioned room features flat-screen satellite TV and free WiFi. There is a safe, and the private bathroom includes a hairdryer. 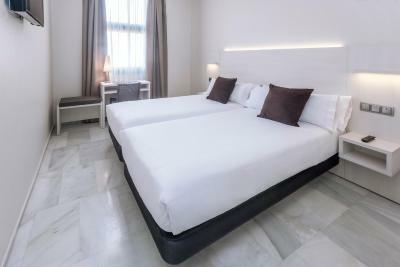 The recently renovated rooms of Serhs Carlit Hotel and its unbeatable location, make it the best option for your stay in Barcelona. 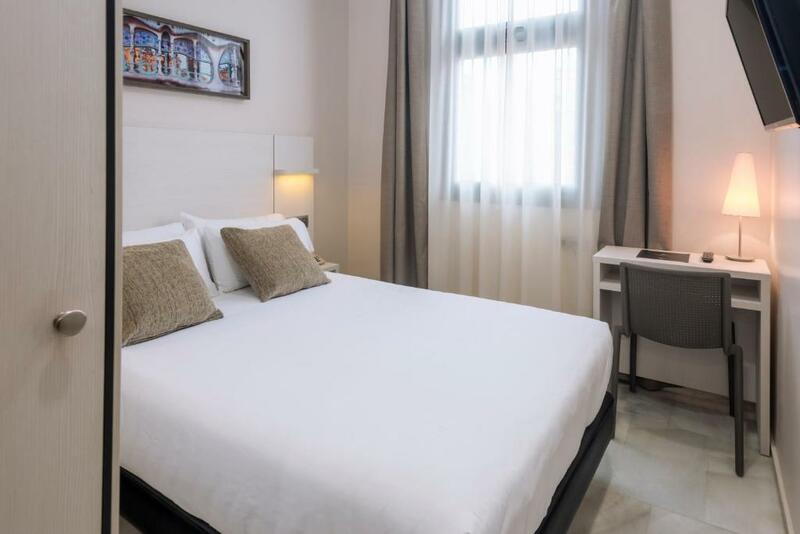 Serhs Hotels Carlit is just 900 metres away from Sagrada Família Basilica and 15 min walking from Passeig de Gràcia Boulevard. House Rules Hotel Serhs Carlit takes special requests – add in the next step! Hotel Serhs Carlit accepts these cards and reserves the right to temporarily hold an amount prior to arrival. The pillows are too soft and my neck is uncomfortable. Good location. Helpful staff. Small room but clean. Our room was very small but we only needed it to sleep in. Room had a tile floor and could have been cleaned a little more thoroughly. We could hear noise from within the hotel at night and lights from the hotel lift area came through our bathroom window which then came through to the bedroom. The service provided by reception was excellent. Breakfast was very good and the location was perfect. The hotel is the noisiest place we have stayed in as the lift is extremely noisy and went all night long with people arriving to their rooms. The lift screeched and made a very loud banging noise when it stopped. The lift is close to every room in the hotel. The staff were very helpful they moved us to another room as their was a school below our window and was very noisy. Cleanliness of room could be improved under the bed and in bathroom. Reception staff were very helpful. Breakfast was excellent. The breakfast was fantastic, with lots of regional products. The staff was very friendly. The bed was large and super comfortable (although they insisted in tucking the blankets, making me make a mess of it as I opened the bed, as, unfortunately, it's a common practice in hotels). 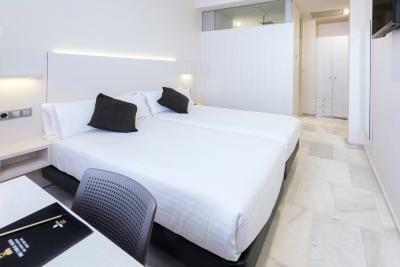 Hotel very close to the subway, bus stop H10 - H12 - 7, The Sagrada Familia reachable on foot in 5 minutes. Special thanks to the receptionist on duty which she organized an early check-in after a night passed out due to another hotel cancel the reservation the same date of our arrival. Value for money 101%. Great location and a really nice property and staff were fantastic so helpful and friendly. We had a small double room but was more than adequate in size for us. Walls were a bit thin and was able to hear neighbors sometimes. Not clean, noisy, run-down. Location was okay but there are plenty of better hotels for the same price. Would not stay here again. The colleagues are really nice, and it’s convenient in traffic. But it’s too noisy in the night. Bed was very good. Breakfast buffet was ok.